Do you need orthodontic treatment, but are uncomfortable with the idea of braces? Invisalign aligners provide the same degree of orthodontic correction as braces, but with the advantage that they are virtually invisible when you wear them. This amazing technology straightens and realigns your teeth using clear plastic aligners, replacing the wires, bands and brackets of traditional braces. The Invisalign system uses a series of aligners that are made from clear plastic. The aligners hold and gradually reposition your teeth over the treatment period, usually two years. Every two weeks during treatment you will receive a new set of aligners that is slightly different than the one it replaces, so over time your teeth are moved into place. Invisalign aligners can be removed while you eat or floss your teeth, making them much more convenient than braces. If your teeth are properly aligned, they make a smooth u-shape in your mouth. If they are crowded, they can be misaligned, making them difficult to care for and affecting the appearance of your smile. Invisalign can correct crowded teeth, giving you an even, healthy smile. A: You may experience mild discomfort when you begin to wear your aligners for the first time, but as you grow accustomed to wearing them this discomfort will fade. 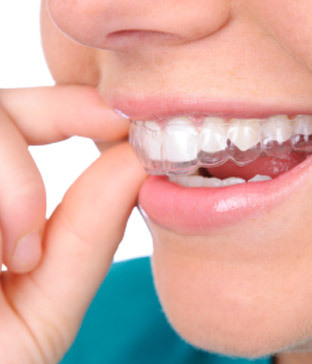 Q: Can I remove the aligners while I sleep? A: Because the aligners are working around the clock to realign your teeth, it is best to leave them in overnight.